A red-faced pub chain has held its hand up to an embarrassing gaffe over a local hero it named a Highland pub after. 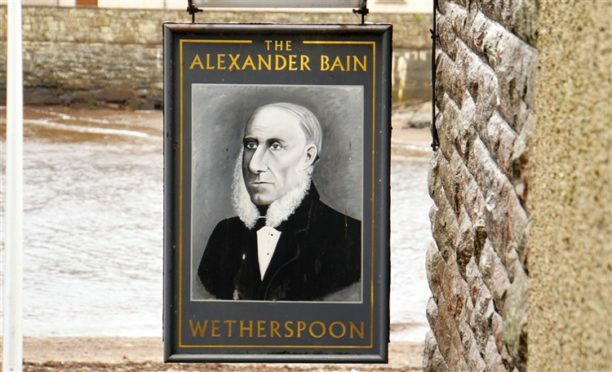 The chain pub in the Caithness town was named after Alexander Bain, inventor of the fax and the electrical clock, and carried his likeness on the traditional swinging sign – or so everyone thought. Because now, JD Wetherspoons has held up its hands to an embarrassing gaffe over the local hero it named the pub after. It has just emerged that the face on the sign which has been hanging outside the pub since it opened 16 years ago is not him but another luminary of the same name. Inside, alongside a fulsome tribute, is a correct portrait of the shy genius, who was born just outside Wick in 1810. Alexander Bain invented the electric fax. But the exterior sign on the former post office building in the centre of the royal burgh is not him but a contemporary, the eminent Aberdeen philosopher Alexander Bain. The mix-up, spotted by local Fiona Gunn, was pointed out to the pub owners who accept responsibility for the faux pas. Spokesman Eddie Gershon said yesterday: “It’s just been human error on our part and we have been unaware of the problem until we were alerted two weeks ago. “It was put up in good faith and obviously none of our customers picked up on the issue. Mr Gershon said it is however not looking to replace the outside sign. “The pub has just been put up for sale so changing the sign is not really a priority,” he said. JD Wetherspoon regularly names pubs after famous individuals. The Wick pub pays homage to the inventor who in 1843 patented the first fax machine, which formed the basis for television. His role in this was posthumously recognised in 2016 when he was awarded an Emmy by the National Academy of Television Arts and Sciences.